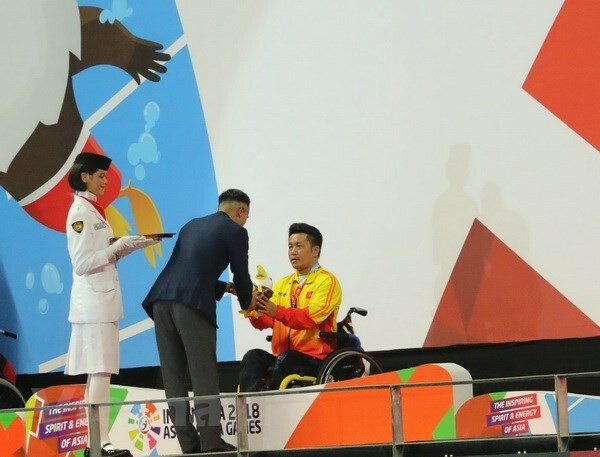 (VOVWORLD) -Swimmer Nguyen Thanh Trung brought Vietnam its first gold medal on the first day of the Asian Para Games in Indonesia. Trung finished first in the 100m men’s breaststroke in the SB4 disability category with a time of 1 minute 48 seconds on Sunday. “I am very proud and happy. I hope this first gold medal will bring good luck to the Vietnamese athletes at this year’s Asian Para Games. I have made a lot of progress since 4 years ago thanks to my coaches,” said Trung. The same day, swimmer Vi Thi Hong won a bronze medal in the 50m women’s free style. More than 2,700 athletes from 45 countries and territories are competing for 500 gold medals in 18 events.